One of my favorite Dutch words is bioscoop (cinema). It seems appropriate therefore that one of my favorite words should tie in with one of my favorite architects. You see, from 1936 until 1958, the top floor of this building is where Gerrit Rietveld lived. He was also responsible for the redesign of the building, including the fantastic facade. The interior of the theater itself was glamorous neo-baroque, while the floor that the Rietvelds lived on was more in keeping with the Spartan simplicity of his preferred style. 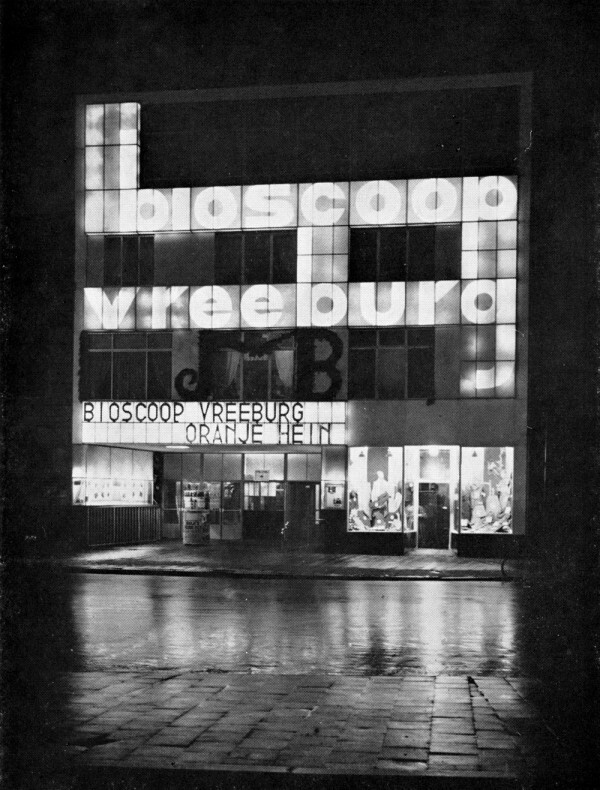 The facade is a fantastic modern design featuring light boxes covered in milk glass, which could be lit up each night to advertise the theater’s name: Vreeburg Bioscoop. The facade was both eye-catching and functional. The building itself still stands, although the interior has been changed considerably. It no longer houses an ornate cinema and the Rietveld floor seems to have been taken over by a company called Internet Advantage. 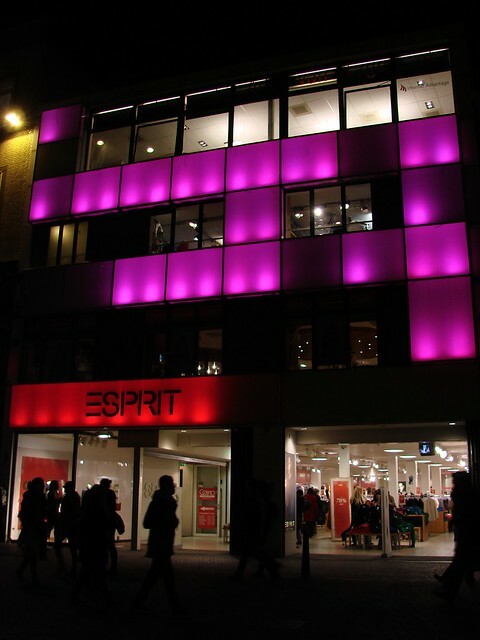 The ground floor is home to Esprit, selling clothing that always seems that little bit too expensive for what it is. Fortunately, the light boxes remain. They may no longer spell anything out, but they do light up, changing colors from moment to moment. Amazingly, the light show doesn’t seem to be part of the Trajectum Lumen route. It’s just a nice bit of color and style, simply for the sake of it. As Oscar Wilde would say, art for art’s sake. This entry was posted in architecture, entertainment, history, photos, points of interest, rietveld, time travel and tagged architecture, Gerrit Rietveld, photography, rietveld home, time travel, trajectum lumen, Utrecht, Vredenburg, vreeburg bioscoop by Alison. Bookmark the permalink. 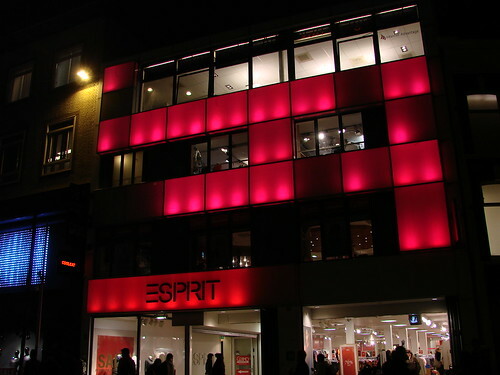 At least the original intention of the building remains, the milk glass and light boxes even if Esprit has replaced the original cinema, the core is still standing. Great information Alison! I never seem to pass the building at night, so when I did see it all lit up, knowing its history, I was so happy to see they’ve kept the basic elements of the old building. It’s a shame it is no longer a cinema but it’s nice that they have not changed the outside look to much. I would have loved to have seen a film in the old cinema. It sounded grand! Nice blog topic! Unfortunately the light boxes didn’t remain. The new light boxes are square, the old one’s were rectangular. Atelier De Bondt made a new front design inspired by Rietveld.